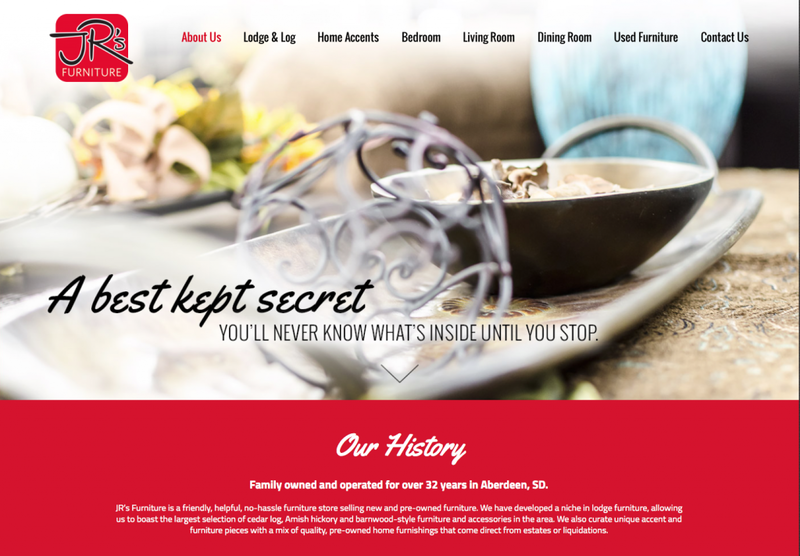 Affordable Websites In Aberdeen, SD — Imagine you own a furniture store with hundreds of pieces, in a myriad of categories. Creating a website that includes everything would be a major undertaking and have a hefty up front cost for development. Meanwhile you enjoy the immediacy and crowd building ability that Facebook offers, and you’re pretty comfortable working within that platform. Also, several people at the store can also use Facebook with a sufficient degree of proficiency. Imagine also that your existing old, yellow page-created website isn’t up to snuff and you have no idea how to access it. And the yellow page company is breathing down your neck trying to get you to let them design a new mobile friendly version for you. But who are they? This is essentially where the folks at JR’s Furniture found themselves a few months back. So they called McQuillen Creative to get some answers. We have no problem recommending other solutions, if they truly are solutions. JR’s just didn’t feel comfortable having a new website designed by an invisible person, while they mediated through a sales rep. That’s never an ideal situation, especially when you enjoy face-to-face meetings and strategizing together. Our solution? We scrapped the idea of a conventional website that had a page for this, that, and the other and opted for a single, scrollable, one page website that would auto conform to any mobile device. To solve the problem of uploading hundreds of furniture pictures to a website, we decided to link each section of the website to a specific Facebook gallery, created by the client. This alone saved them thousands of dollars in development time. This is one of the most affordable websites we’ve created, with the best value. It’s important to point out that “mobile friendly” is not the same as “mobile optimized.” The “Friendly” option simply means a single site will work and auto conform to any device. “Optimized” means we spend a lot more development time on exactly how the mobile version will look and behave. Sometimes we limit information on the mobile version, or even create different images and icons for the mobile versions. JR’s site is “mobile friendly” which seems to be working perfectly for their needs. The new website looks like a traditional site, with a menu bar at the top, but instead of linking to different pages, the single page layout simply drops or zips down to the appropriate section. This makes it ideal for mobile users. We also wanted to give them a SEO boost by including nearly every single type of item they carry in live text so Search Engines will find it. If you’re familiar with JR’s, you may notice they have a new logo and a new sign out in front. We designed those as well. Oh, we also took all the pictures of the furniture pieces featured on the site. That was a little extra, but we still kept the entire project very economical. We’re still making some final tweaks to the site, but take a look. It’s working pretty well so far. We’re pretty sure we have a web solution for any budget. Give us a call to find out, 605-226-3481. And take a look at JR’s website.